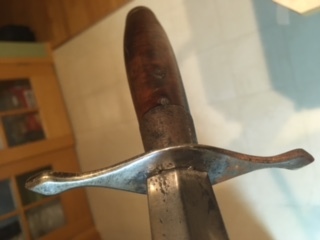 Attached are pics of a sword passed down in my family. After my great-grandmother passed in '82, it came to me. 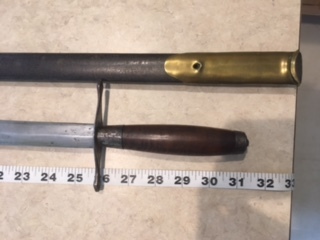 After a historical search found an ancestor fought & died in the revolutionary war, we began asking questions about this sword. Major John Head was part of the French-Canadian Rebal forces who came down to help fight The Battle of Saratoga in 1777, he would later die in The Battle of Bennington in 1795. The scabbard is obviously not original to the sword and easily identifiable. The sword is not that easy. 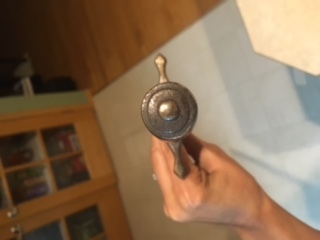 It has no markings whatsoever. The local museum called it curious. They said it was old, but can't place the time period. We are not looking to sell, we just want to know where this came from. It was suggested that brilliant minds on forums like these might hold the answer. 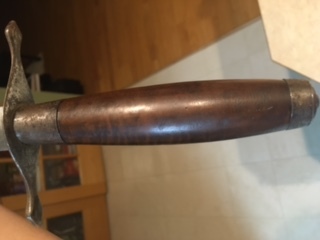 It looks very much like an American Spadroon sword of the Revolutionary War period. A simple-hilted sword meant mostly for thrusting, perhaps made by a local blacksmith. 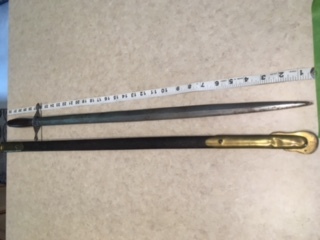 There are several examples of crude American swords like this in Neumann's Swords and Blades of the American Revolution. The museum was confused because of the riser. Would that have any bearing on the forging time period? I admit I am completely ignorant on all things sword related and am only going off what I have been told by people more informed than me.